Colin Banfield has been working in the telecommunications field for over 20 years. Colin has been using spreadsheet programs for over 18 years and has used every major spreadsheet program at one time or another, including every version of Microsoft Excel for the PC. He works closely with acclaimed spreadsheet author and guru John Walkenbach in beta testing and providing valuable input for John's award-winning Power Utility Pack Excel add-in, as well as in reviewing many of John's spreadsheet books (including the previous edition of this book, which was originally written by John). Colin's largest Excel project to date is a comprehensive tool designed for central office equipment configuration, pricing, and manufacturing, that is used by sales, engineering, and manufacturing personnel. John Walkenbach is one of the country's leading authorities on spreadsheet software. He's principal of JWalk & Associates Inc., a Southern California-based consulting firm that specializes in spreadsheet application development. John is also a shareware developer, and his most popular product is the Power Utility Pak add-in for Excel. John has written more than 250 articles and reviews for publications such as PC World, InfoWorld, Windows, and PC/Computing. 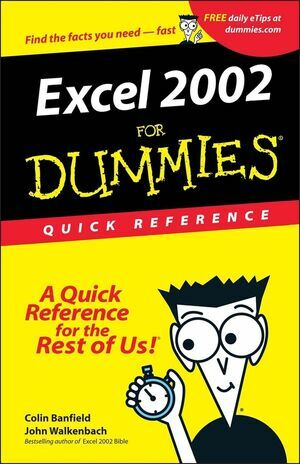 In addition, he's authored more than 20 other spreadsheet books, including Microsoft Excel 2000 Bible, Excel 2000 For Windows For Dummies Quick Reference, and Excel 2000 Programming For Dummies. He also maintains the Spreadsheet Page on the World Wide Web (http://www.j-walk.com). When he's not banging away on his computer keyboard, he's probably banging away on one of his guitars, trying to cop a few blues licks from Freddie King. The Big Picture: Microsoft Excel 2002. Part I: Using Workbook Files. Part II: Working with Worksheets. Part III: Entering and Editing Worksheet Data. Part IV: Using Formulas and Functions. Part V: Creating and Using Names. Part VI: Auditing Your Work. Part VII: Formatting Your Data. Part VIII: Printing Your Work. Part IX: Charting Your Data. Part X: Linking and Consolidating Worksheets. Part XI: Working with Lists and External Data. Part XII: Goal Seeking and What-If Analysis. Part XIII: Analyzing Data with PivotTables.